Jen Pollock Michel and her family opened their home to the kind of man the rest of the world shuns. While growing up he had been abused emotionally and sexually. The trauma led to addiction; the addiction led to crime. He couldn’t keep out of prison. He needed help. He needed Jesus. It’s a beautiful story. Right up until the part where the man attempted to prey on one of Michel’s five children. The tragedy unfolded on Christmas Eve; thankfully, he was prevented from acting on his intent. Against all evidence, the man claimed innocence. Michel’s family no longer welcomes him into their home. Don’t expect the warm glow of Thomas Kinkade to blur the hard truth of home in Michel’s account. Instead, Michel—previously the author of Teach Us to Want [review]—offers an unexpected apologetic for the Christian faith through our experience with home. 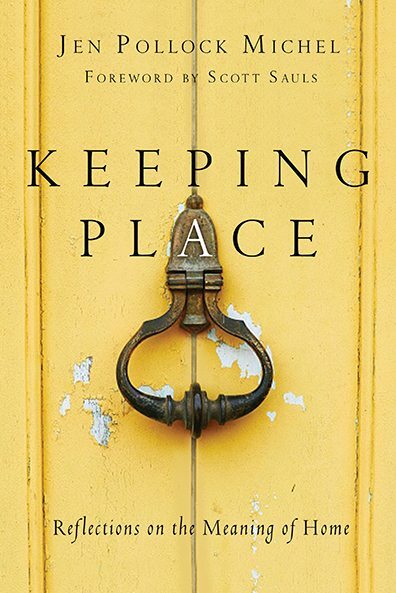 From various angles she evokes the reader’s longing for home, a place of welcome, safety, honesty, and shelter, but she won’t allow us to invest any home on earth with hope that can only be secured by Jesus Christ. Yes, it’s good that you want to go home, she assures us. And yes, the Bible promises us we will get what we want. But not in this place, not until Jesus returns or calls us home. Michel is most vivid when describing her own mixed experience with home. As the child of a working mother, Michel always wanted more of her mother’s energy and attention. But in writing about her own experience as a stay-at-home mom, she says, “Every day struck with tsunami force, and only by running full speed did I think I could outwit the daily violence.” Home, then, is hardly the refuge depicted inside lifestyle magazines. IVP (2017). 237 pp. $16. Her historical account of domesticity offers instructive context. She explains why the home has never been the exclusive domain of women’s work: for simple survival, both men and women fed and clothed and cleaned. More modern factors led us to associate domesticity with despair. As the interstate highway system enabled the growth of suburbia, commutes to work and even to see friends and family lengthened. When couples left cities and farms for suburbia, they lost dense, multigenerational networks of family and work. No wonder the women were so lonely at home as the men worked downtown. While Michel addresses the plight of stay-at-home moms, she doesn’t see their experience as normative or prescriptive. Not everyone has the means to support a large family on one salary, nor can everyone afford to make a home in one place for a lifetime, or even for a long time. Refugees fleeing war today don’t want to leave home; neither did racial minorities fleeing oppression last century, but staying home meant despair, even death. The concept of home evokes powerfully personal images, and it can’t be standardized across cultures and circumstances. We’re on our way to glory, learning obedience with every halting step that brings us home to Jesus. So where can we find hope when home fails to deliver wedded bliss? Home is bound to disappoint because we’re prone to wander, prone to leave the God who loves us. Adam and Eve distrusted God’s good provision of home, so he banished them from the Garden of Eden. Nowhere, however comfortable and safe, has ever felt quite like home for humanity since then. But that’s not the end of the story. We can go home again. Until then, we toil. And sing. And open our home to strangers, even though we know the risk. No, this world isn’t our home, but we’re not just passing through. We’re on our way to glory, learning obedience with every halting step that brings us home to Jesus.